Beggars All: Reformation And Apologetics: Did Jerome Change His Mind on the Apocrypha? Did Jerome Change His Mind on the Apocrypha? Matthew said: Did you forget that St. Jerome ended up upholding those books as Scripture. You mislead people by your remarks. A present for Matthew: Guest Blog: Did Jerome Change His Mind on the Apocrypha? by Ray Aviles (who should be on my blogging team, but refuses to comply with my wishes). "Pay attention to what Jerome actually wrote, instead of what is said by others about what he wrote. He himself abjured his earlier enthusiasm for hebraica veritas. You may read his thoughts on the subject, translated by myself, here. Notice the change in his thoughts, typically ignored by those eager to tout his much earlier preference for a short canon, as found in the later prologues to Tobias and Judith. Jerome indeed clearly won the day, though not in the way you think, as we have followed his later and more mature opinions in preferring a larger canon which was not established by Jewish authorities but by Christian bishops." "2b.) What part of “the later prologues to Tobias and Judith” did you not understand? The prologue to Kings was his earliest. Tobias’ and Judith’s were twenty years later, very near the end of his life. His mind had changed in that time. Statements to the contrary are worthless, from whatever source. Jerome himself proves them wrong." "Thanks for writing, Janet. I haven’t read that, but it’s an excusable statement. For centuries people have misinterpreted Jerome’s statements and position on the apocrypha for a number of reasons. Firstly, the order in which he translated, which I give on this page, shows a clear warming toward the apocrypha on the part of Jerome as his translation work progressed. Also, of the apocrypha, he most certainly did translate both Tobit and Judith, the latter with the plain statement that he did so because a bishop requested it, the First Ecumenical Council treated it as Scripture, and therefore Jerome preferred to be on the side of the Church, essentially, rather than against her. He also translated the additions to Esther, though placing them at the end of the book with instructions on where to place them, and he did translate the Song of the Three Holy Children in Daniel, though marking it with asterisks (to indicate it wasn’t in the Hebrew, though modern studies show that it’s original was certainly Hebrew and not Greek or Aramaic). Primarily, Jerome’s translation work was apologetics-based, providing Latins with a translation that was closely approximate to what the Jews had in Hebrew, specifically for the reason of theological discussion. He never disparaged the Septuagint, which he recognized was the Church’s Bible, and made a clear distinction between his own work and it. So, things are a lot more complex in regards to Jerome’s parts of the Vulgate and what is typically, superficially said about it. Yes, other apocryphal books weren’t translated by Jerome and are actually the Old Latin versions of those books. The best description of Jerome’s position is found in his prologue to the Books of Solomon, which I have translated: “Therefore, just as the Church also reads the books of Judith, Tobias, and the Maccabees, but does not receive them among the canonical Scriptures, so also one may read these two scrolls for the strengthening of the people, (but) not for confirming the authority of ecclesiastical dogmas.” This is identical to the position of St Athanasius of Alexandria, as well, that these books are useful, particularly for new Christians, but are not used for establishing doctrine. Note, however, that this statement was written about ten years before his translation of Judith, in the prologue of which he says, “But because this book is found by the Nicene Council to have been counted among the number of the Sacred Scriptures, I have acquiesced to your request….Receive the widow Judith, an example of chastity, and declare triumphal honor with perpetual praises for her. For this one has the Rewarder of her chastity given as imitable not only for women but also for men, Who granted her such strength, that she conquered the one unconquered by all men, she surpassed the insurpassable.” Couple this with his statements on Tobit, “For the studies of the Hebrews rebuke us and find fault with us, to translate this for the ears of Latins contrary to their [i.e. the Jews'] canon. But it is better to be judging the opinion of the Pharisees to displease and to be subject to the commands of bishops.” St Jerome shows a clear turnaround in his opinion of the value of the apocrypha here, in these, the two last of his translations, accepting the judgment of the Church of their value rather than that of the Jews and their shorter canon. In that respect, it would be better to suggest that while Jerome’s earliest work held the apocrypha in something close to scorn, by the middle of his years of translation work he held them valuable as non-Scriptural reading, but most importantly by the end of his work he had certainly come to value them as Scripture, as the Church did. I hope that helps!" Since nobody here to my knowledge (especially Turretinfan who approved of Edgecomb’s translation) is a scripture/linguistic/patristic scholar or scholar of any kind, I tend to follow Edgecomb’s analysis and that of the Church unless proven otherwise. I have brought Edgecomb’s commentary to Turretinfan’s attention before, but as it is Turretinfan’s customary attitude to obfuscate anything that might place his position in trouble he quite conveniently ignored my various posts. Of course they will ignore it. They only appeal to historical sources when it benefits their position. When it doesn't help their cause they either ignore it or revise it. "But it is better to be judging the opinion of the Pharisees to displease and to be subject to the commands of bishops." I could theorize by this statement that Jerome by middle age had found that a certain advantage was to be gained from no longer "butting heads" with various bishops. That's a rather familiar model even in our time. A new congressman goes to Washington as a reformer and is instead himself "reformed" by Washington. The idealistic researcher finds that access to research funding is very "handy" and so placates those that control the purse-strings. Odd that Cajetan and Ximenes sided with Jerome that the deuts were not for doctine, but ok for reading. Do you really not see the difference between relying on a translation of primary source material and relying on the ill-founded opinion of that same translator? I don't believe that you're that stupid. Leaving aside your personal attacks on me and my friends, you contribute little when (as here) you make such fundamental category errors (whether ignorantly or intentionally). Edgecomb should be (and has been) praised for translating. Good work on that. However, Edgecomb's biased opinion (he's Eastern Orthodox) is not supported by the historic evidence. What Edgecomb (and others who wish Jerome agreed with their expanded canon) is doing is attempting to use later ambiguous comments from Jerome to overturn earlier unambiguous comments. Ultimately, these attempts fail, because the careful student of history eventually catches onto this error. I know (and you know) that the reason you appeal to Edgecomb instead of Jerome is that Jerome himself doesn't support your argument. I'll let you judge for yourself what the effect on your religion is from this approach. Bellisario: It's easy to make that sort of accusation, but it is a lot harder to back it up. I've demonstrated your ability to do the former and inability to do the latter here (link). “Do you really not see the difference between relying on a translation of primary source material and relying on the ill-founded opinion of that same translator? I don't believe that you're that stupid. Am I to understand that you are really that stupid to assume that I do not see the difference between relying on a translation from relying on the well-founded opinion of the same translator? I certainly did not imply that. Where is the category error? Perhaps if you are going to condemn me for my “personal attacks” you should avoid the same. I had stated that to my knowledge none of you are scholars of anything. Of course I might be a little strict with my understanding of scholar, but please tell us Turretinfan, if you are indeed a scholar, where are you published? Exactly. I would say that your biased opinion (you are a heretic) is not supported by the historical evidence. I am sure that you were able to free yourself from your Reformed bias when reading the prologues, as we have seen your ability to do this before (unfortunately nothing comes to mind at the moment). Perhaps you should go back and reread Edgecomb’s argument and the relationship between Jerome’s prior understanding of the Church’s position on the longer canon from that which was expressed of the First Ecumenical Council. As I have said before, perhaps you should address Edgecomb’s comments. My previous post (already linked above) already addresses the substance of the matter. "It's not clear to me whether Jerome was being confused or sarcastic. Nicaea did not decide the canon, and had they done so, one would hardly expect the later councils of Hippo and Carthage to omit reference to this fact." The fact that you find this as meaningful commentary is quite insignificant to me. Do you have all the works of Nicea that nobody else seems to have which would dispute Jerome's comment, or are you merely speculating that Jerome was incorrect based upon your own imposition of some requirement that Hippo and Carthage needed to follow? I hope you don't believe that you have the same source material with which Jerome was working with. I hope you don't believe that you have the same source material with which Jerome was working with. He does, its called google. Read any scholarly account of the development of the canon. I suppose you were just trying to add a little levity to this tense combox. But, of course, our sources are different from Jerome's. Google has actually indexed an enormous amount of that information, and I wouldn't be surprised if Google's library passed the content of any physical library in the next five to ten years. Five years ago "Google scholarship" was something of a joke, in ten years failure to research with Google (or some similar tool) will be negligent scholarship. The Fan of Turretin accuses anyone who doesn't agree with him as being biased. You see Alex, this is how the game works with the Fan of Turretin. If you quote a scholar who comes to another conclusion other than his, then they are "biased." So the Fan of Turretin then goes and finds a Protestant "scholar" who agrees with Him, but he of course is not biased. The question of course is, why does the Fan of Turretin care what Saint Jerome taught? Saint Jerome didn't write Scripture, did he? According to Protestants, St. Jerome shouldn't hold any weight as to what one believes about Divine Revelation; after-all they have Scripture as their "only" authority concerning doctrines of salvation. I guess something as important as the Canon of Scripture doesn't make that cut. Exactly how much authority is the Fan of Turretin giving the writings of St. Jerome anyways? In the end, it really doesn't matter. 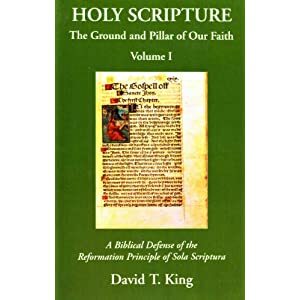 The Fan of Turretin will pick and choose among scholars that agree with him, and he will use other authoritative sources outside of Scripture when it is convenient for him to do so. Shame on you Alex for quoting a scholar who disagrees with the all-knowing sage, The Fan of Turretin! I don't know anything about Edgecomb, but I justed wanted to point out that it appears both Cajetan and the Trent fathers believed that Jerome did not accept the apocrypha as part of the inspired canon. I wonder if TF and the rest of these "Reformers" are ready to jump on board with other teachings of St. Jerome? After all, if TF is ready to jump on board with St Jerome's apparent rejection of the apocryphal books, I wonder if he is on board with St. Jerome's teachings on Mary's perpetual virginity, or his view on the state of virginity as being superior to that of the married state? I wonder if these "Reformers" subscribe to his rigorous asceticism and monastic lifestyle, engaging in penance and fasting? Or is it more likely that will try and cherry pick line or two here and there to try and defend their heresies? I think that is more likely. But again, why choose Jerome as an authority in this matter? Why not decide these things for yourself rather than appeal to a man to feel good about your rejection of Canonical books? Isn't the Holy Spirit and Scripture Alone good enough for you all, or do you need St. Jerome to back you up? As for jumping on board with Jerome ... are you willing to agree with Jerome on absolutely everything? No? But for some reason if we don't, we're the ones with a problem. I see. Cajetan had a great explanation for the difference between Jerome and some of the others. Let's place his credentials against Edgecomb's if Alex and his pals want to make this about scholarly credentials. After all, Cajetan was no fan of Turretin (how could he be?). First of all I don't have to believe everything St. Jerome wrote. I have Christ and His Church to teach me. You on the other hand, being the all-knowing sage, have to rely on your own intellect, which we can all see is seriously flawed. Keep digging through Church Father's writings to manufacture opinions that agree with your own, and see where it gets you. I have the Scripture and the Holy Spirit to teach me. Even if you don't think I have them, you should at least have the intelligence to recognize that I have never claimed to obtain these things by my own unaided intelligence. As for your church - it lies to you. It lies to you about the canon - it lies to you about the assumption - it lies to you about the infallibility of the papacy. You trust it, but it is not worthy of your trust: it is not a church of Christ. We expose those lies through history and Scripture, but you shut your eyes and harden your mind against the Scriptural and historical evidence. Your zeal, which is obvious, would be admirable if it were for the truth. Pray that God will show you whether what I say is true. "First of all I don't have to believe everything St. Jerome wrote. I have Christ and His Church to teach me." So you're free to pick and choose among the teachings of the ECF and later writers? That sounds like a recipe for chaos. Unless of course we have an Infallible Guide to instruct us as to which of these writings conform to Church Teaching and Scripture. Is there Magesterial guidance that has been propagated regarding which of St. Jerome's writings are binding on the faithful? No EA, that is the difference between Protestantism and orthodox, catholic Christianity. I don't have to go through the Church Father's writings myself and decide what is to be held De Fide. Christ tells me the truth, through the one apostolic Church that He established. The Church Fathers are mere witnesses to the Church of an earlier age. Turretin, the Church doesn't lie to me, your own flawed intellect deceives you. The Bible doesn't tell you what the Canon is, does it? You have no infallible way of knowing what the Canon is, so you, by your own flawed intellect go through Church Father writings trying to justify your own position on what you think the Canon is. As far as the Church being the Church, it is apparent that you are not as familiar with the Church Fathers as you think you are, or you selectively deciding to pick and choose from what they write based on your own flawed intellect. You have no idea as to what history teaches, or what the Scriptures teach. You are like all of those heretics before you, all using their own flawed intellect to come up with novel teachings on what they think the Scriptures mean. Do you remember a man named St. Athanasius, who refuted the Arians, who also were quoting Scripture to defend their heresies? Since you apparently didn't learn anything from our debate (the one that you think you won), let me give you a refresher. The Arians also thought they could take the Scriptures for themselves outside of the Church and interpret it for themselves. But St. Athanasius told them they were interpreting the Scriptures incorrectly and not as they had been handed on to them in the Church. You know, the one you reject. "But after him (the devil) and with him are all inventors of unlawful heresies, who indeed refer to the Scriptures, but do not hold such opinions as the saints have handed down, and receiving them as the traditions of men, err, because they do not rightly know them nor their power" Festal Letter 2"
You sir are sadly in the same boat. "No EA, that is the difference between Protestantism and orthodox, catholic Christianity. I don't have to go through the Church Father's writings myself and decide what is to be held De Fide. Christ tells me the truth, through the one apostolic Church that He established." Interesting. Yet you read the ECF anyway. Why, if Christ's Church has delivered all truth to you in a comprehensible way? And why especially be reading writings (even from ECF) that run counter to the teachings of the church, since you know those writings to be in error? Your errors are too numerous to be addressed within the word limits of this comment box. Thus, I've provided a detailed rebuttal on my own blog, for those who are unaware of the absurdity of your canon argument or the impropriety of your attempted reliance upon Athanasius (link to detailed rebuttal). TF, I have too many other projects going on to run off and address another one of your wild goose chases. If I get a chance I'll look at it next week. Until then try not to give yourself a headache by gazing into your mirror all day, admiring your own reflection. You present a false dichotomy of sorts. Us "Reformers" aren't bound to the opinions of fallible men but you knew that :) However, this doesn't mean that we cannot find agreement on other things. For instance, if Jerome denied the Apocrypha and, yet, believed in a perpetual virginity, it doesn't present a "pick and choose" scenario for us, because we don't ascribe to a position where to agree with one on ONE thing means we must agree with one on ALL things. I believe your tradition would say the same. Hence, this is distinctively your own false dilemma. So why do we dare to bring up Jerome in regards to the canon? For two reasons. One, because of the FEW Catholics who have attempted to recreate his position (into an acceptance of the apocrypha, hence, the article) and, two, because he serves as a hostile witness against those who claim that the church was unanimous in its acceptance of the Apocrypha prior to the Reformation. Evidently, Jerome's position lingered and scholarly men weren't afraid to voice it, even as far as the Council of Trent. So...bottom line...the dilemma resides in those who recreate Jerome's position and not on those who disagree with Jerome's on other issues. Man, common sense would tell you that we are in agreement with Rome on certain doctrines, but agreement, evidently, doesn't translate into total agreement. Therefore, your post is a quite misguided. Your church doesn't tell you what the canon of its teachings is. If it is a problem for me to lack an infallible canon of Scripture, then it is a worse problem for you to lack an infallible canon of "Tradition." This is quite simply a silly argument to make. It is obvious that Turretinfan is struggling with the distinction between oral and written communication. His argument doesn’t even pass the common sense test which speaks volumes concerning where Turretinfan is going with this. Turretinfan knows very well what lies at stake if he were to admit that there is an infallible canon. No one here has been able to contradict Edgecomb's analysis of Jerome's preference for the longer canon. Appealing to Cajetan says nothing because Cajetan did not address anything relevant to the argument, or one similar, to the type that Edgecomb, along with others, make. If Carrie, Turretinfan, or any other person here is able to identify a comment from Cajetan addressing anything similar to Edgecomb's argument, then you will have something to work off of. If not, then stop putting words in Cajetan's mouth. Even if Cajetan came out and said that the Church was wrong, and Jerome never accepted the longer canon, what would that really prove in the final analysis? Nothing. Especially in view of the Protestant position. The fact is that the Church has always held as Scripture a longer canon and not what the Protestants possess. Even Jerome stated that Nicea held the longer canon, and Jerome went by the Church. Thanks, as usual, for your thoughts. I'm not persuaded that they have any merit. I hope folks are reading them, though - and carefully. That's not what "wild goose chase" means. It seems you're being quite selective here. Give me the prima facie source(s) where Jerome reneges his earlier position and advocates a longer canon. And what about scholarly sources that are in agreement with Edgecomb's assertion? And what about a longer canon? And which of the "longer" canons did he advocate? What are the books which he "later" agreed are to be included into the corpus of inspired, canonical Scripture? No Turretin Fan as usual you are wrong. Wild Goose Chase...a useless and often lengthy pursuit. It fits you and your arguments perfectly. They are useless, lengthy and always a waste of my time. LOL - you really can't see that you misused the idiom?